3D platformers featuring colorful creatures and inventive landscapes saw their greatest success in the N64 era before being summarily retired as time went on. This year, we’re seeing a return to this style of game with titles such as Poi and Yooka-Laylee. 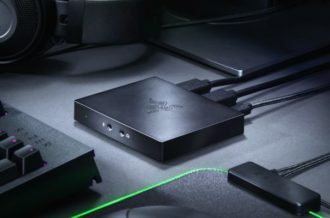 Although they manage to capture the spirit of classic titles, they also fall into many of the same design traps rather than learning from them. Snake Pass is a different sort of return to form. On one hand, it appears like a lost Rare game with its adorably huge-eyed snake protagonist, soundtrack by David Wise and levels bursting with collectibles. 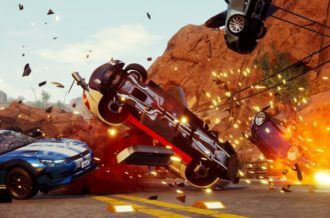 Yet Sumo Digital managed to do more than rekindle a love of 3D platforming. 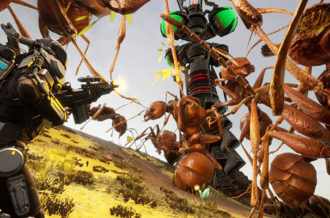 They also managed to innovate in a thoroughly stagnant genre in an incredibly smart way. Much of this innovation comes down to the choice of player character. The snake, humorously named Noodle, is not simply an anthropomorphic being like most platforming heroes are. You won’t find any arms, legs or sneakers on Noodle. Nope, this is just a long orange and black striped snake with a cute grin. So how do you go about platforming without any legs and, therefore, jumping? 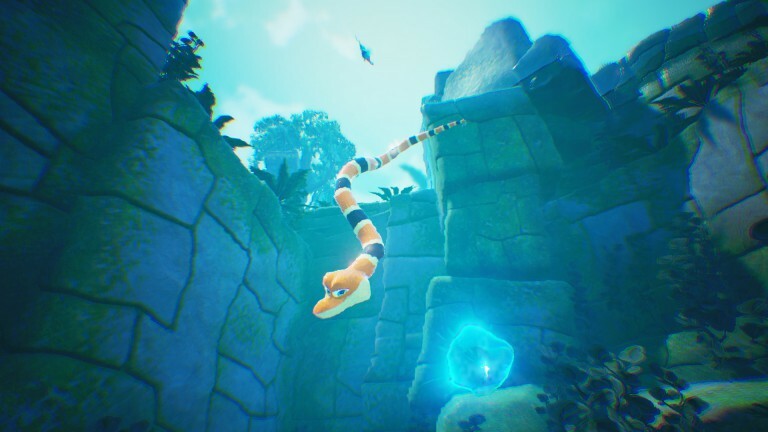 Snake Pass is not a traditional platformer because it puts players in control of a snake which moves like real ones do. That means it gains speed by slithering left and right along its path. That also means it can maneuver up or around obstacles by coiling up on them. As such, instead of feeling like a core platformer it becomes more of a puzzle platformer due to the physics-based actions of Noodle. Snake Pass is tremendously clever in how it teaches players the basics of snake control before letting them run free with it. There’s fortunately not much to the controls, as they can suddenly feel strangely complex when in the midst of a dangerous climb. Propelling forward requires holding down on your controller’s trigger rather than being mapped to an analog stick. This comes in very handy when you need to position the snake without necessarily moving forward. Noodle can lift their body up from the power of its muscles, coil up and around bamboo shoots and grip tightly when needed. You can also summon your bird pal Doodle to pick up Noodle’s tail. This results in a lighter snake, but also one which has less body length to potentially use for gaining momentum or staying safely constricted around an object. That’s it. Noodle has no extra special skills (and Doodle only learns one more late in the game). Still, it’s easy to get tripped up. Early on in the game it might feel as though the snake is too darn slippery. The controller-based gameplay even gets a little weird when you first notice that the game requires occasionally holding onto three buttons simultaneously, while also moving the analog stick. 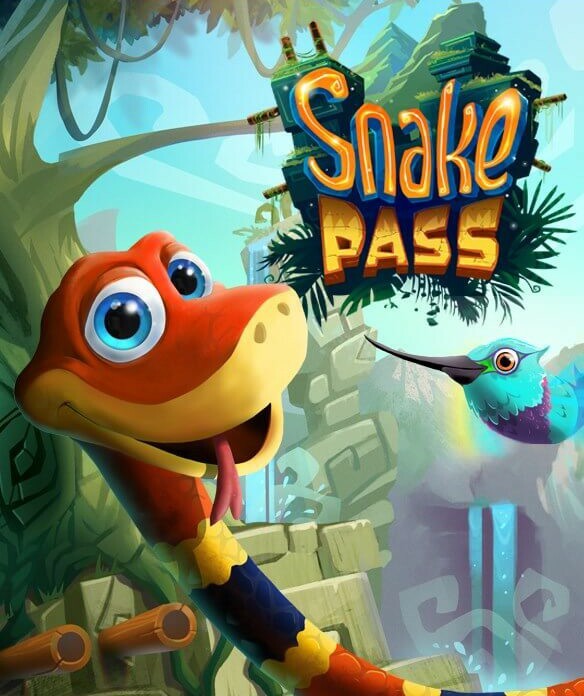 But once you get used to the controls, Snake Pass becomes immensely more enjoyable. At that point you really start to become confident with Noodle’s moves and can really take charge of each stage. There are fifteen in all spread across four themed locations and each becomes progressively tougher. Overall it takes around four to five hours to finish the game. To be fair, most of the stages aren’t all that complex. It’s only in the final world – where tons of thin poles are suspended above deadly plummets – that things get particularly rough. 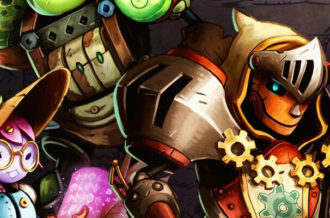 The most challenging aspect of the levels are related to collectibles. Each stage only requires collecting three colored shards to proceed. However, there are two other forms of collectible goodies to pick up along the way to finishing a level. These include blue orbs known as Wisps and golden coins. There is a set number of Wisps per stage and most are easily obtainable. Some tend to hide themselves away, meaning you need to keep a careful eye out. Coins are occasionally hidden in plain sight but most tend to actually be suspended in dangerous ways. Collecting all five coins per stage is the toughest challenge available to players. Nabbing each one will effectively turn Noodle into a stunt snake. 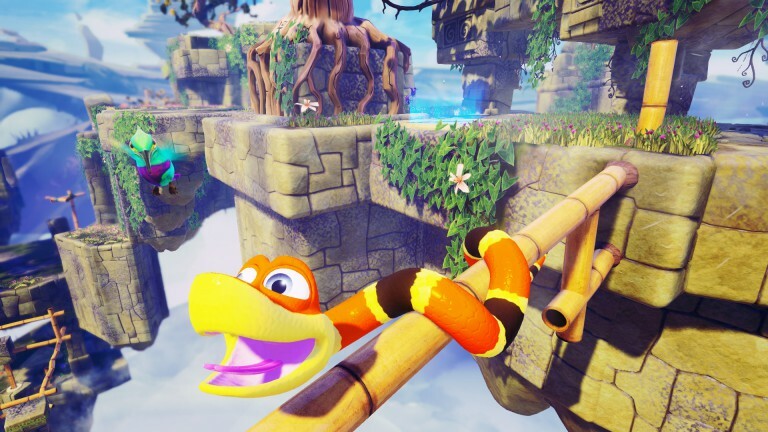 Visually, Snake Pass looks like what you might expect a N64 platformer would appear like on modern platforms. Every stage is bright and filled with colorful foliage. In some respect, it looks a lot like Viva Pinata (minus the pinata animals). The biggest negative is that there are only four different themes slapped onto stages. Even then, they don’t look particularly different for the most part. Fortunately, every level does have its own challenges to overcome and none ever end up feeling exactly alike. While there is a storyline to semi tie Noodles’ journey together, it feels like a tremendous afterthought. David Wise is best known for his contributions to Rare game soundtracks such as the Donkey Kong Country series. It only makes sense that a game evoking classic platforming goodness would go to him for their soundtrack as well. The music does not capture the highest points of Wise’s discography but is enjoyable enough in and of itself. The music, combined with ambient sound effects, makes for a pleasant atmosphere to slither through. Even Noodle’s sound effects, which initially feel goofy, become charming in their own right. 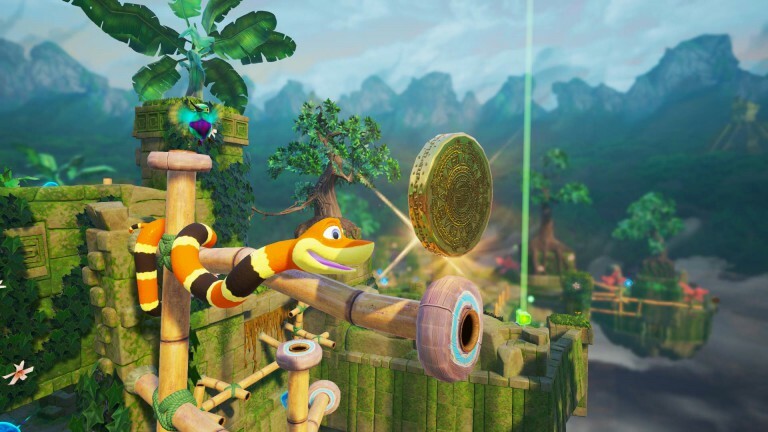 Snake Pass is a modern attempt to rekindle 3D platforming fun in an intelligent way. 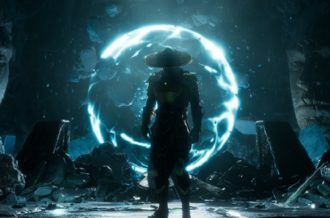 Instead of falling back on all the old tropes (and problems), players are presented with a protagonist which totally changes up the nature of platforming. Each stage only requires three objects to collect, meaning folks need not dread yet another collectathon. On the other hand, those who look to 100% complete games can enjoy reaching out for the tougher coins. There’s something left to be desired with the general lack of storyline, but fortunately the gameplay is excellent enough to make up for it. Even after finishing the game you’ll likely want to go back and perfect your performances because the gameplay is just that refreshing.